Carrie Bee Creates: One Monthly Goal - May 2018 Finish! One Monthly Goal - May 2018 Finish! I can't believe May is almost over and it is time to report back on my One Monthly Goal! 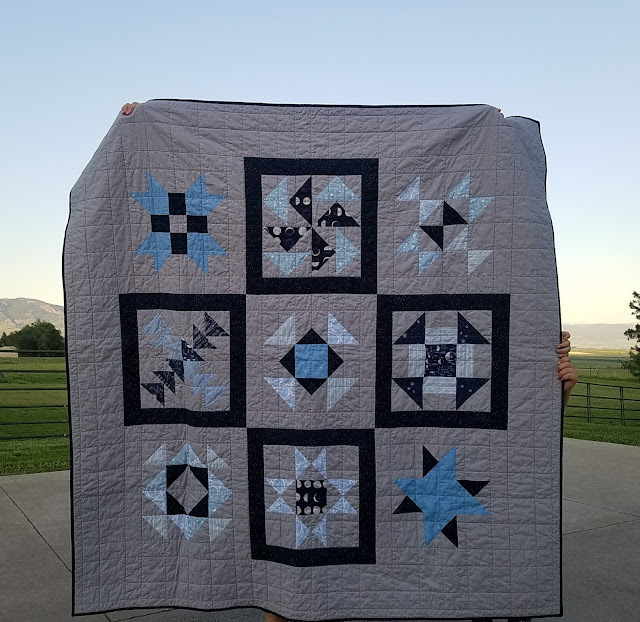 I am excited to say that I was successful in completing my goal, which was to Quilt and bind a Baby Quilt Top using blocks from the Quilter's Planner 2018 Block of the Month Sampler Sew-Along. I ended up using the Cotton & Steel sprinkle for the binding and I am happy with how it turned out. This was the first quilt I have given to someone that I don't live with. It was a little difficult to let it go, especially because I liked it a lot and it was technically my best finish thus far. But I'm hopeful it will be loved and used by the family that is welcoming a new member! When I gave it to Mom she told me these were her colors, how lucky is that? It is also likely to be the last quilt I make using my modest but mighty Janome Magnolia 7330. This was the machine that started me on this journey and has served me so well, but I also dreamed of an upgrade for quite some time. So I'm super excited to have a new baby in my home too! I know it will be an adjustment but I'm overjoyed like any new Mom would be. This turned out wonderful! Thanks for linking up with Elm Street Quilts One Monthly Goal and congrats on your finish! Congratulations on your new baby Carrie. As for letting go of your quilt every new quilt will probably become your new technically best quilt. It is really beautiful and I'm sure the family will love it. Isn't it fun that it turned out to be their colours.I love the little hands at the side of your quilt in the photo.